Shop online for 138 in stock slot cars at discounts up to 70%. HO Slotcars is the most popular of the 4 in stock slot cars categories, then 1/32 Slot Cars, and 1/24 Slot Cars. AFX is ranked #1 out of 7 in stock slot cars manufacturers, followed by Innovative Hobby Supply, and Round2. This is the 1/24 Ultra Reflect PhotoReal Metal Signs Variety Slot Car Decal by Innovative Hobby Supply. This is the Mercedes C9 #62 HO Scale Slot Car from AFX Collector Series - Clear. Super G Plus Tune Up Kit is designed to be used with AFX Super G+ Racers, such as the Jaguar, T'Bird, Indy Mobil and the Indy P'nzoil. This kit keeps your Super G-Plus cars at peak performance. 6" Curved track is designed to be used with the AFX racing series. recommended for ages 8 and up. 2- 6" Curved Tracks. 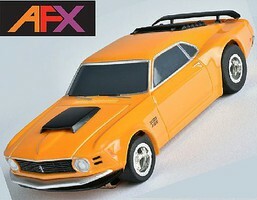 6" straight track is designed to be used with the AFX racing series. recommended for ages 8 and up.